Executive pay is always in the news. Just last week an executive of Yahoo walked away with what was said to be a 100M parachute. I was interviewed by CBC radio on upcoming sunshine laws that are going to be enacted in Alberta. Last month, Ontario Power Generation fired three executives after an auditor general’s report on excessive compensation. The Premier of Ontario has vowed to crack down on excessive public sector executive compensation. Do politicians have a track record of properly addressing compensation? I don’t believe so. Here are ten reasons that the governance of executive pay is broken, starting with politicians. Politicians. Politicians have been the single greatest driver of increasing executive pay. Transparency or “sunshine” laws that politicians enact enable executives to utilize the pay of other executives to exert upwards pressure and threaten to leave, which is difficult to counteract. Transparency is good, but transparency without any guidance towards pay setting results in pay spiraling upwards. There is not a single jurisdiction that introduced pay transparency where pay has gone down. There was a time where executive pay was written within an envelope in a top desk drawer, and the focus in pay negotiations was on what the executive can do for the company, not what everyone else was earning. Pay consultants. Pay consultants use this pay data and sell it back to the company in the form of “peer benchmarking,” which consultants have cleverly invented, which is now the predominant way to set pay. This means executive pay is driven by cherry-picked larger companies at the 75th or 90th percentile, resulting in a baked-in pay increase to the executive irrespective of performance. Lack of professional standards. Lawyers and accountants can lose their license if they breach their fiduciary duty to their clients. They (we) have professional standards and rule-books addressing the duty of care, conflicts of interest, fee arrangements, continuing education, and just about everything you can think of to ensure the client is well served. Compensation consultants have no such obligations. Anyone can put out a shingle and call him or herself a pay consultant, and they do. You can sit on a compensation committee without any compensation expertise whatsoever. The requirement to be a director is shockingly low. In many cases, you need only to be over 18, not bankrupt and not insane. Maybe it is time to raise the bar for compensation consultants and compensation committee members. When advisors have standards, and pay-settors have expertise, they will make better decision. Unnecessary complexity. Ask any director how much did his or her CEO “earn” last year, and see if you get a consistent answer. You likely won’t. It’s a simple question that deserves a simple answer. Pay depends on whom you ask and can’t even be defined. Is it “intended,” “realized” or “realizable”? We now have multiple “vehicles” for getting all types of pay to executives, with multiple valuations and performance periods. It becomes impossible to understand, value, and compare pay to performance. Therefore, mistakes and self-interest are possible. Pay needs to be radically simplified. Complexity deliberately frustrates and obfuscates basic analysis. Captured pay-settors. Even if a compensation committee has formally independent directors, this does not reflect social relationships, the use of company resources by the directors, interlocks, excessive tenure, over-boardedness, reciprocity, favors, exorbitant pay to directors, vacations, gifts, donations, jobs for directors’ children, and a host of other factors that my research and work with boards uncovers. The compensation committee is then an arm of management. Heads I win, tails you lose, or no downside for risky behaviour. Pay needs to incorporate risk-taking. We know that risk management in many companies is immature, so how can the downside of a decision possibly be incorporated into pay? If it is not, there is no or limited downside for executives to swing for the fences. Pay metrics and awards should account explicitly for risk. Most do not. This is not an insignificant point, as risk-taking compensation fueled the financial crisis. Regulators are addressing compensation and risk, but not fast enough. Undue influence of Management. One highly paid CEO said to me once, “I will outgun any compensation committee.” If pay is truly a free market decision between owners and executives, the power, expertise and participation of shareholders must equal that of executives. Pay committees will need surgery for this to occur, starting with shareholders determining who is on their pay committee. That way, pay committees are the agents of their owners, not management. Directors not listening to Shareholders. Directors assume that they know what shareholders want but this is folly. Surveys reveal a wide divide between shareholders and directors on executive pay. Directors need to meet directly with shareholders without executives present. Most don’t. Lack of oversight and accountability. In the public sector in Ontario, there have been several governance scandals, including Ontario Power Generation, eHealth, Ontario Lottery and Gaming Corporation, and Ornge, that have included compensation and spending. What this reveals is defective oversight. Governance is not government. Ministers oversee 100s of agencies, boards and commissions operating in major sectors of the economy. Without independently assured oversight, and directors chosen exclusively on merit and not pre-existing relationships, often to the Minister or party in power, these scandals will continue. Premier Kathleen Wynne would be well served to address this lack of accountability and good governance. Saskatchewan has an excellent upward reporting model involving corporate secretaries and use of governance tools I helped create that apply to all crown companies. One of my colleagues recently said to me, on the outlook of corporate governance in 2014: “Seems like a stand pat year with lots of tinkering but nothing profound happening.” With pay governance to improve, we might need some profoundness and not as much tinkering. Richard Leblanc is a corporate governance lawyer, speaker and independent advisor to leading boards of directors. He is currently teaching corporate governance at Harvard University. He can be reached at rleblanc@boardexpert.com. 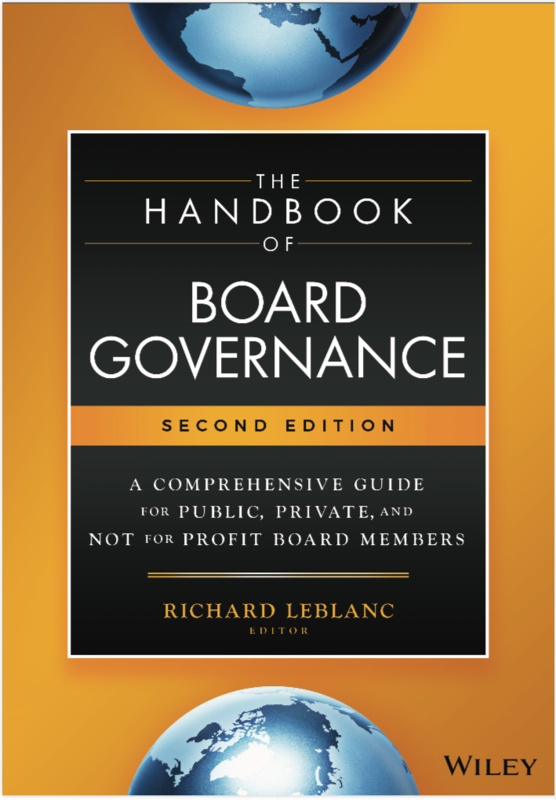 The governance of executive compensation by boards continues to be in headlines. Regulation has emphasized the independence of compensation committees and consultants, similar to what Sarbanes-Oxley did for audit committees and auditors. However given the occupy movements and wealth disparity, more regulations emerge including potentially binding say on pay by shareholders and diversifying compensation committees and boards. The following are 10 areas leading compensation committees and advisors (including lawyers and compensation consultants) should look to, to get ahead of emerging regulations. 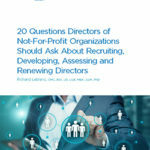 I offer several suggestions for reforming executive compensation based on current and emerging regulation and best practice, including interviews with directors, reports to regulators and work with leading compensation committees and boards. I address committee member and compensation consultant independence (Dodd-Frank), the closed shop nature of pay setting and diversity (UK), risk-adjusted compensation (Basel), clawbacks and malus (Dodd-Frank, UK, Basel), pay-for-performance (US to come, UK current), shareholder engagement and binding votes (US, UK to come), pay equity and disparity (US and UK to come), CEO succession and director pay (general and the NACD). For those compensation committees and their advisors who wish to get ahead of the curve, here are ten suggestions, independently and constructively offered. Lastly, management has an interest in paying directors beyond what is required for a part-time job, including for non-executive chairs. Committees need to push back on exorbitant pay that can be reasonably seen to compromise their own independence. In the US, for example, the NACD had recommended a 15-16% premium for Lead Directors, specifically to guard against compromising of independence. This premium is much lower than 2X or 3X seen for non-executive chairs, and the spirit of director pay overall. Ten years after the enactment of Sarbanes-Oxley (S-Ox) following Enron and WorldCom, S-Ox’s legacy has been the independence and proper reporting to and oversight by audit committees. However one American governance commentator remarked that “S-Ox is kindergarten compared to this,” “this” meaning the sheer volume of corporate governance change as a result of the financial crisis. When we look back at the legacy of the corporate governance reforms following the financial crisis, they will be in three main areas: compensation, risk and shareholder rights. We are probably not even through half of the changes, nor have compensation committees adjusted to them.